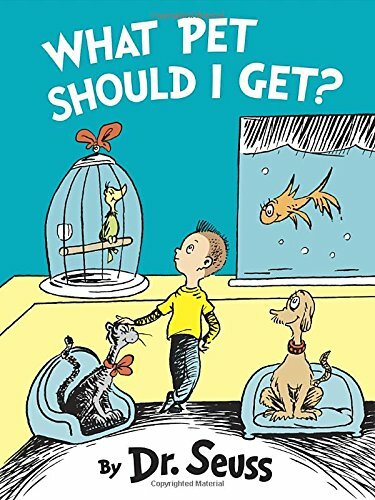 Literary Hoots: What Pet Should I Get? What happens when a brother and sister visit a pet store to pick a pet? Well of course it's too hard to choose just one! Both find all sorts of animals to love. But in the end, a decision on one pet must be made. What will they choose? Well, prepare for some disappointment. Okay, maybe that is a little harsh, but I do wonder if Dr. Seuss is rolling a bit in his grave now that this long-lost manuscript is published. Maybe it was lost for a reason. Basically, while the text still had Seuss' famous rhymes and an odd animal thrown into the mix, it wasn't particularly well done. There were a few hop and skips in the rhyming scheme that would make it a tad difficult to read aloud without some practice. The vocabulary isn't necessarily the best for beginning readers (again, a made up animal or two, plus some longer words). Actually, the story overall is hardly engaging or interesting; the brother and sister are looking at pets. And more pets. And yet some more pets. And then there's the ending. Which, I won't spoil for you, but it was a bit of a let down. Really, I won't be in a huge rush to recommend this book. I was pretty disappointed, as a Dr. Seuss fan. Sure, there's the novelty of it being "the long-lost manuscript!" but that's about it.